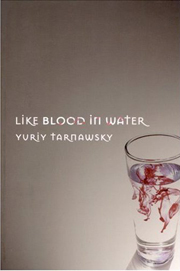 Yuriy Tarnawsky is responsible for the complex syntactical literary candy behind Three Blondes and Death, the novel Meningitis, and Like Blood in Water, as well as numerous collections of poetry, books of fiction, and plays in his native Ukrainian. His most recent collection of fiction, called Short Tails (JEF Books/Civil Coping Mechanisms), is a vivid, dream-like sequence of stories told in an avid and plain voice. Each story, on its own time, is a twisted gallop through a city of the seemingly innocuous. But these tales are not about a city—they are about the small significances that lead us to naves of imagination where the reader has always wanted to be. 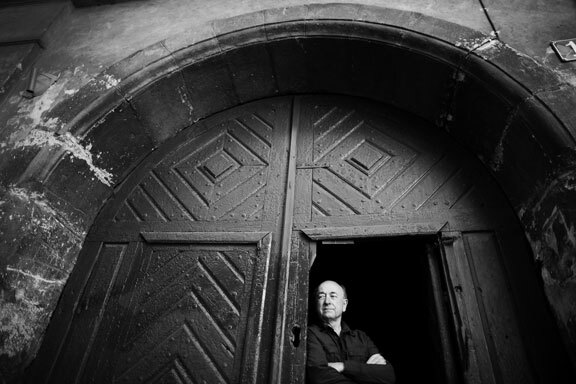 Tarnawsky and I met over fresh varenyky and beer at a Ukrainian restaurant in Manhattan’s East Village to discuss the question, among others—were these stories based on dreams? He lives in White Plains, New York, with his wife. David Moscovich: You mentioned that some of the stories in Short Tails were composed using the titles as prompts. Could you elaborate on this process? Yuriy Tarnawsky: Yes, it was a very joyful experience. The first story was “Missing,” which I had had in mind for a number of years but kept postponing. I was really happy to be able to finally get to it. The title is a gerund and I came up with other gerundive forms to go with it, such as “Receding,” “Leaving,” and “Screaming.” (This last one I finally excluded from the collection since it differed fundamentally from the other stories). I didn’t have any story or plot in mind, but let my imagination roam as it pleased, as happens in a Rorschach inkblot test. As I said, it was sheer joy to work like that. 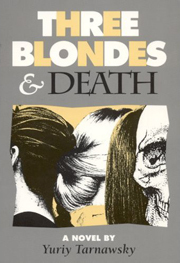 Three Blondes was an extremely tightly structured work, and all novels require some degree of control over their structure, but here I felt completely free and wrote whatever came to mind. “Surchild,” for instance, arose when I misheard “surplus” spoken on the radio. “Fourth of July” is a synonym for “independence day” and it evoked this particular story. “Smoke” and “Stone” were like that too, the first one prompting me to do the second as a companion piece, stone being in a sense the antonym of smoke. “AC Robat,” which is, philosophically at least, the central story in the book, came about when I was trying to come up with names having the harsh “r” sound in it, and thought of “Robat,” as a follow-on name to “Robak” in ”The Performance.” I saw the possibility of what would happen if I added AC to the name and this led to the story. Most of the others came about in similar fashion. DM: Did inspiration for the story ”The Albino Inside You” come from a dream? YT: No, it actually didn’t, although it should have and the dream should have been the one with which the story ends. In this particular story, I actually struggled with the ending, not knowing how to wrap it up, and then, one day, it came to me in a flash. I must have had it in mind all along and just kept it buried inside me under all that rational crap that gets in your way as you write. I suspect it was there from the beginning and it gave me the idea for the title, but then I had to tunnel my way back to it. I forget how the title actually sprung up in me. I recall, though, realizing that a bone, being white, could be compared to an albino and that then the human skeleton would be “the albino inside you.” I liked the way the phrase sounded and it propelled me to write the story, which came out easily until the very end. DM: In the story “Lenin's Brain,” the narrator buys a package in an antique store in Greenwich Village that contains the brain of Vladimir Lenin. Is there anything autobiographical that influences this story (your feelings about Lenin or the Soviet Union, for example), or the way you write in general? YT: No, there really isn’t, except for the fact that I have been to Greenwich Village many times. I got the idea for the story from my friend, the well-known Ukrainian painter Olexander Dubovyk, who was telling me about a biography of Lenin he had recently read, recounting the details from his childhood and his signing execution papers, and that his brain was withered on one side, as I describe. He is the one I have dedicated the story to. So, the origin of this story is different from all the others. As is true of all of my writing, there is virtually no autobiographical material in the book, except on a very basic level, such as appearance of objects, details of situations, types of personalities, and so on. I find that biographical material holds me back, hampers my creative process, cramps my imagination. Imagination is so much more fertile than life. But of course, imagination has to work on material from life experience, and it does it on that very basic level, as I have just mentioned. DM: Why the title Short Tails? What is the significance? 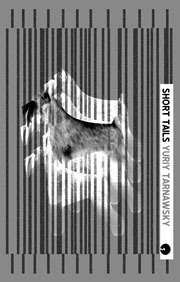 YT: I remember driving to work one morning, many years ago, and the phrase “short tails” popped up in my mind as a pun for “short tales,” the opposite of “tall tales.” In other words, I am saying that these are honest to God true stories despite being usually so outrageous. In the book I try to point out the absurd nature of life and I think the title is very appropriate for this. Finally, a short tail implies it having been cut off, which is painful, which points out another aspect of life. It was I who chose the idea of showing a dog with a cropped tail on the cover, as a visual pun. I think the artist, Michael Seidlinger, did a wonderful job in representing this. DM: We spoke a little about standing behind the words we write, as writers. That perhaps especially, in the more experimental or non-commercial realms, where we are crafting work which is primarily about the work itself, the perception of others can be an impediment, and at worst, an infringement on the work. What about the value of peer critique? YT: I am uneasy about the practice of other people telling you how to write. This is especially true for beginners who haven’t yet developed their style and their writer’s persona and are easily pushed off the course. In fact, the very phrase “teaching creative writing” sounds to me oxymoronic. How can you teach someone to be creative? You have to create yourself. I have been thinking about this issue for years and have actually developed a sort of a teach-yourself handbook for writers, which consists of exercises that point out what happens when you take a certain path in your writing—different point of view, different tense, etc., etc. I did this for poetry, fiction, and drama. I have taught over the Internet the poetry part with students at a university in Ukraine and held a seminar on part of the fiction exercises at University of Louisville. I find this kind of teaching useful, because here the student learns from his own work. But I feel that other people’s suggestions are very dangerous. Yet, I can’t say that they are always destructive or not useful. Perhaps, rather than having other people tell you how you should improve your work, they should just tell you how they understand your work, what they got out of it, so that you can figure out yourself if what you did was right or wrong. It’s a tricky issue and you have to tread very carefully here. DM: You were a cofounder of a group of avant-garde émigré Ukrainian writers called The New York Group. Could you tell us a little about it? YT: In 1959, a bunch of us, recently arrived Ukrainian émigrés who lived mostly in New York, decided to form officially a group and call ourselves The New York Group and to publish a poetry magazine called Novi Poeziyi (New Poetry). Within a year we were joined by two more poets, one from Germany and one from Brazil, and eventually five more, four from the US and one from Belgium. 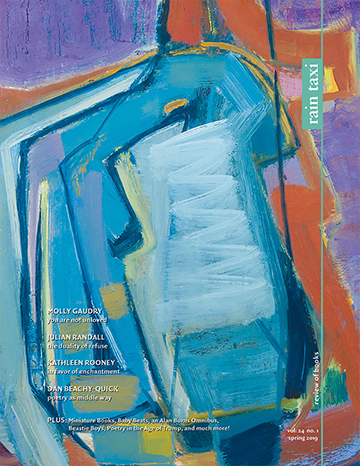 Stylistically, the group was fairly diverse: some of the members utilized relatively traditional poetics, while others were quite radically new. What we all had in common, though, was that we had nothing in common with the older generation of Ukrainian writers. We totally shunned nationalist, patriotic subjects. The group was influenced to some degree by modern American and French poetry, and especially strongly by that from Spain and Latin America. The most interesting aspect of the group is a style many of the members practiced which bears strong resemblance to Surrealism, but closer to Hispanic Surrealism than to the classical French. It seems more organic and less intellectual, being rooted in the national (in this case Ukrainian) tradition. A similar trend appeared in a somewhat younger generation of poets that cropped up in Ukraine in the late ’60s, called The Kyiv School, and the style perhaps should be called “Ukrainian Surrealism,” which might be an original contribution to world literature. DM: At some point you stopped writing in Ukrainian and switched to English. Tell me why. YT: There were a couple of reasons. The first, and probably the strongest, was the fact that I always lived in a multilingual society (Polish-Ukrainian, German-Ukrainian, English-Ukrainian), and was open to outside linguistic influences. I think it was within three years of coming to the US that I started writing in English, although purely for myself, not trying to get it published. Living in America, I was constantly in touch with English, and Ukrainian was for me a private language. Another reason was that I was always creatively stubborn, adverse to editing by others, and wanted to use the kind of Ukrainian we spoke among ourselves rather than the more artificial prescribed literary Ukrainian. The problem was the greatest in prose, where editors would change my language because “it sounded better this way.” My poetry they left alone probably out of deference to that hallowed genre. So in the end (actually fairly soon, sometime in the early ’60s), I switched to writing prose in English, although I continued writing poetry in Ukrainian, primarily, I think, because I was able to publish it. This continued essentially until recently, when I switched to writing exclusively in English, although this might change. DM: How do you feel about translating from Ukrainian to English, and vice versa? YT: I’ve done a lot of going back and forth with my own writing, in particular translating my English language stuff into Ukrainian—poetry as well as prose. But I actually hate doing it. It is a thankless, mind-numbing process, additionally unpleasant for me because it reminds me of my ambiguous status of not belonging anywhere. So that is one more reason why I write in English only right now. I prefer writing in the language I hear around me for the people by whom I am surrounded. DM: How do you balance family life with the writing life? YT: When I worked full time (I worked virtually all my adult life for the IBM Corporation, first as an engineer and then as a computational linguist), it was extremely tough. I would put in hard eight or more hours of work at the lab, come home, have supper, and then sit down to write. At times it was torture. I was exhausted and nothing of value would come out. But somehow I managed to get something reasonably satisfying out from time to time and published a fair number of books. Things got even tougher when I went back to school to study linguistics at NYU. For about seven years I wrote nothing at all. Eventually I took early retirement from IBM and taught Ukrainian literature at Columbia University for a few years. This was even tougher. I didn’t write anything except course material. The added problem here, too, was the fact that this was creative work and it took away my need to write. Then, after leaving Columbia, I started writing like a fiend. I wrote a cycle of plays in Ukrainian called 6x0, which, at nearly 400 pages, I finished in a little over a year. I did Short Tails in a couple of years, and then a book of short fictions I call “mininovels” Like Blood in Water, followed by two additional ones. So now, it’s much easier. Except for the usual house chores, doing income tax, etc., I am free to write whenever I want. DM: You made the switch from poetry to fiction and are now primarily known as a writer of prose. Could you talk about why the shift happened away from poetry? YT: This isn’t quite true. Last year I wrote (in English) a whole, longish (100 plus pages) book of poetry called Modus Tollens, in about six months. I did this because I felt a strong need to write poetry again. But it is true that I didn’t write any poetry between 1995 and 2011. The reason for this was probably because I had stayed away from fiction for so long and couldn’t tear myself away from it. I told you above with what gusto I delved into Short Tails because I craved to write fiction. The same was true with Modus Tollens in regards to poetry. So it’s my dual nature that makes me behave like that. But I must say that, on the whole, I prefer fiction to poetry. I think I view myself primarily as a fiction writer. Poetry is more of a “hobby,” a time of rest from the hard work of writing fiction. DM: What are you working on now? What's next? YT: I have just re-edited the two collections of mininovels I mentioned above and will be looking for a publisher for them. Together with Like Blood in Water they form a trilogy. It is a tightly knit work, more like a big novel than three separate collections. I view it as being on a par with Three Blondes and Death. Then, I have to finish the book of writing exercises I mentioned. I already have all the rules written down, and some examples, but have to complete the latter. That should keep me busy for a while.